Playing a pivotal role to enable the country and the State of Madhya Pradesh in particular in developing high caliber trained manpower in the frontier areas of technologies, to take up challenges of the industry in the fields of infrastructure development, manufacturing innovations, communication, networking and industrial biotechnology applications. Jaypee University of Engineering & Technology, Guna has been established under a Memorandum of Understanding (MOU) with the Government of Madhya Pradesh. The Institute is located at Raghogarh in Guna District of the Madhya Pradesh. The campus is being developed in an area of 40 hectares. Architectural design is by Plural Architectural Consultants, with construction being undertaken by the Jaypee Group itself. Presently a total built up area of 450,000 square feet has been achieved comprising the academic block, students hostel, and faculty residences is functional. 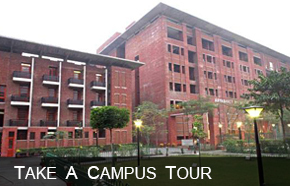 At present 500 students (boys and girls) are housed on the campus along with 30 faculty. At the Undergraduate level, Electronics & Communication Engineering, Computer Science & Engineering, Chemical Engineering, and Civil Engineering are being offered since 2003. Mechanical & Manufacturing Engineering, and Biotechnology would get added in the latter years alongwith Post Graduate courses. It is envisaged that a total student capacity of 1500 students will be reached by 2009. JUET is a fully wired campus and has been designed for total connectivity of all its buildings including the hostels and faculty residences. The fiber optic backbone interconnects the main buildings while CAT 6 cabling provides access within the buildings. Hierarchical switching has been implemented using the latest layer 2/3/4 Cisco switches. The Institute has 3 Computer Labs housing more than 250 nodes operating on UNIX/Windows 2000/Linux. The Campus is fully networked with dedicated Internet access to students and faculty.